Home / Blog / Why Workout With Your Baby? Why Workout With Your Baby? Great for Bonding – whether it is in the gym, park or just at home including your child in the exercises can be really good fun – it is just about being creative. 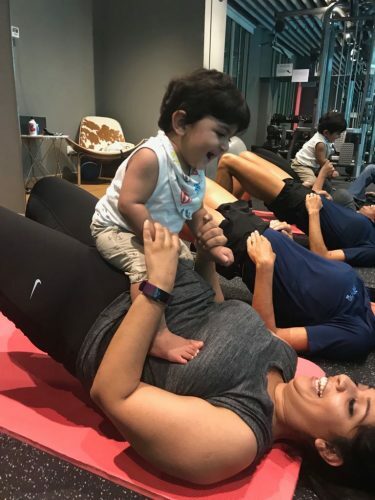 Exercises can range from them lying on their back while you do planks over them chatting away at the same time to performing cobra dips in front of them lying in tummy time to putting them in the baby wearer and churning out some quad burning squats. Make the push up end up with a peck on their cheek and that will help you keep going!! Encourage Motor Development Of Your Baby – exercises with them in tummy time and holding them up in the air will help with back, head and neck strength. Sitting or standing them on your pelvis or tummy while doing bridges or modified abdominal exercises will help them develop their sitting and standing balance. Our sessions designed by Bex Aldridge, a mum herself, are taught by physiotherapists experienced in training you and your baby or toddler. Can be for any age between 2 weeks old and 2 years old. Mum’s or Dad’s or both. If you would like more information just drop us a whatsapp at +65 8358 2144 or email us at info@health2u.sg.